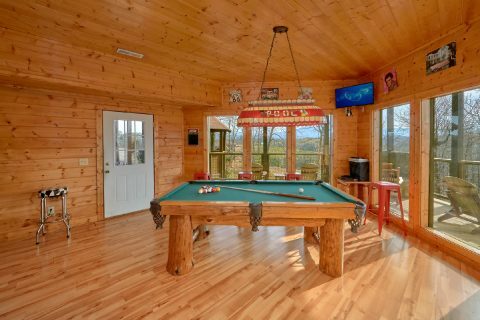 Your home theater lodge in Pigeon Forge is like no other cabin getaway in the Smokies! 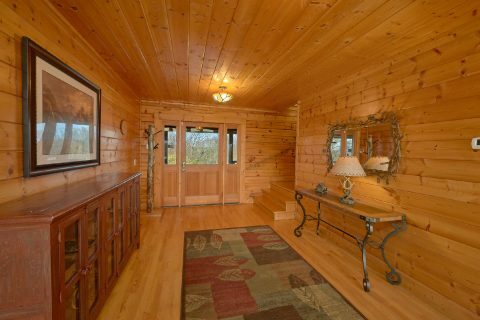 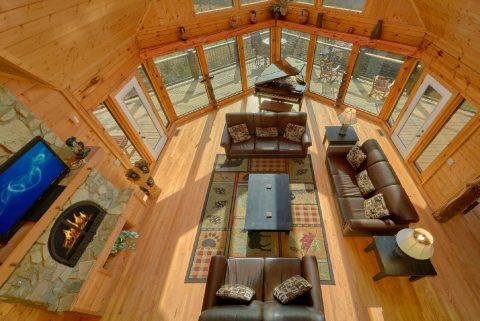 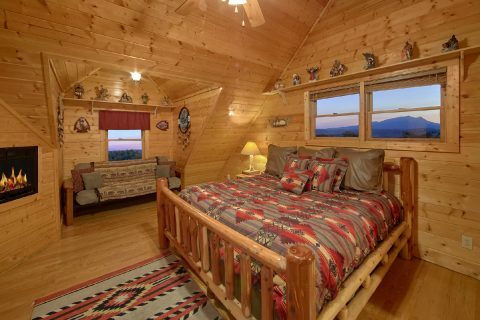 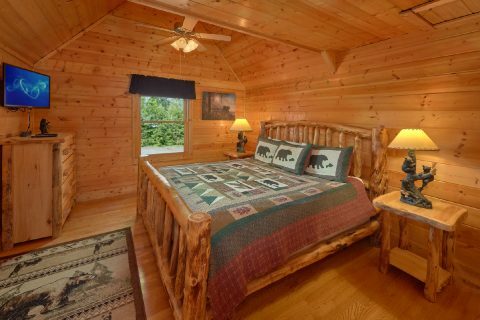 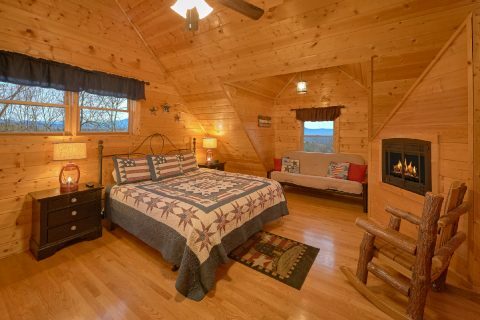 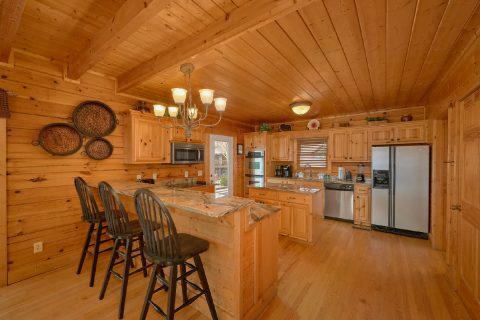 Affordable and luxurious, "Rocky Top Lodge" is cabin living at its finest - a custom-built log home with stylish furnishings and quality craftsmanship throughout. 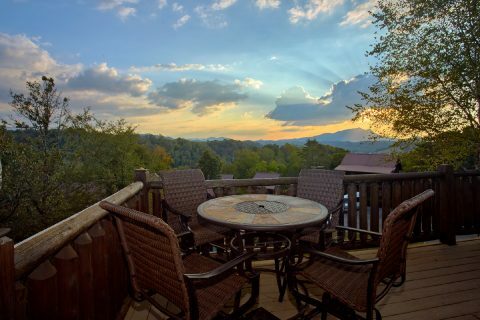 Located in Rainbow Ridge Resort, your 7-bedroom lodge places you and your guests just minutes from Pigeon Forge attractions, dinners shows, shopping and more! 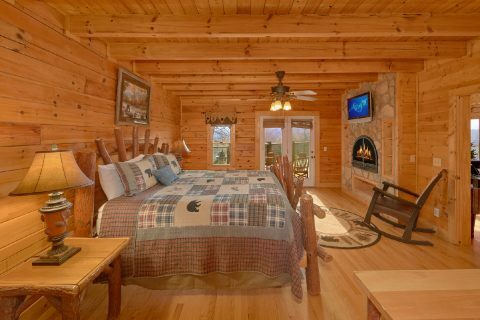 "Rocky Top Lodge" tops most Pigeon Forge lodge rentals in size and definitely lodging amenities. 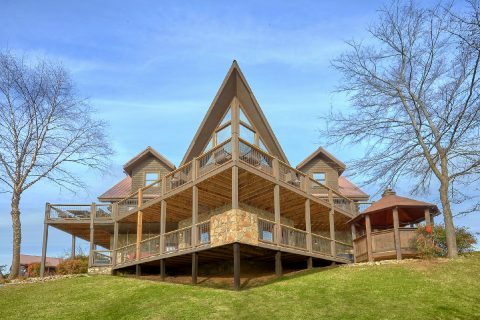 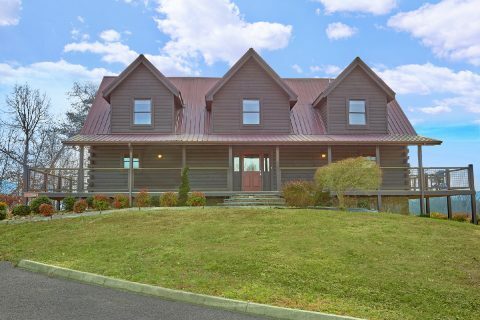 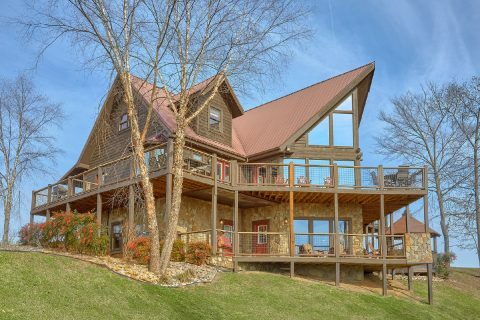 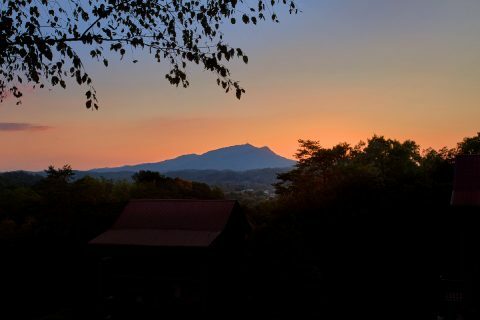 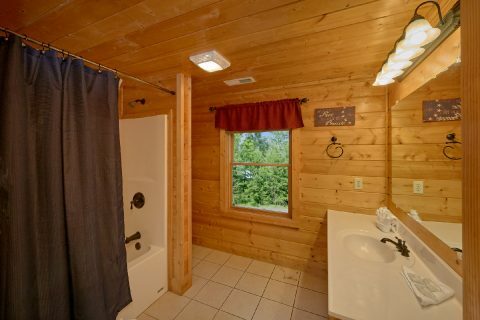 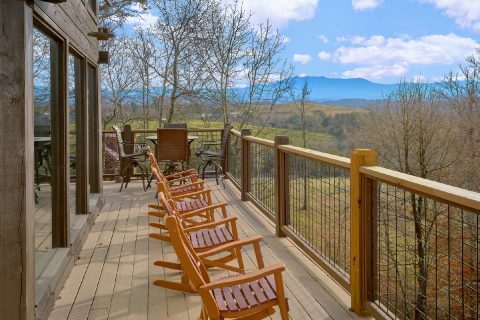 This unique 7-bedroom lodge is perfect for family reunions, church retreats, and groups of friends visiting the Tennessee Smokies. 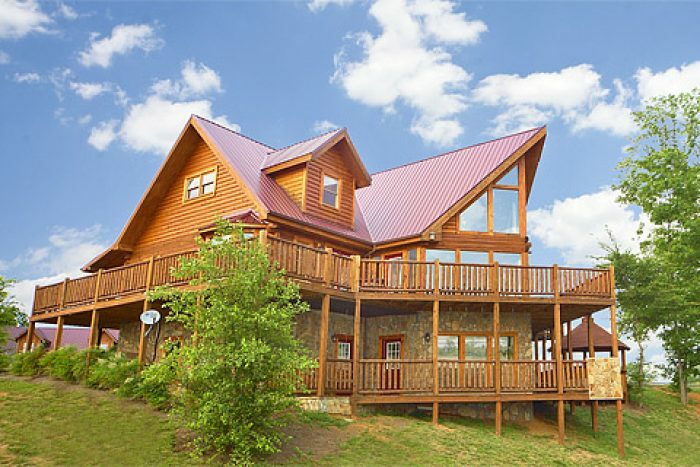 After arriving, use the cabin's free WiFi Internet to share pictures of your luxurious home theater lodge in Pigeon Forge with family and friends back home. 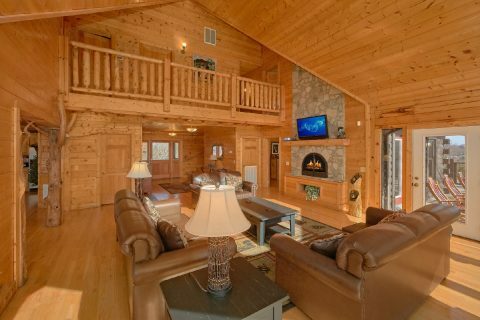 Your cabin's main level living room offers guests plush oversized leather seating, a large screen television, fireplace, and a baby grand piano! 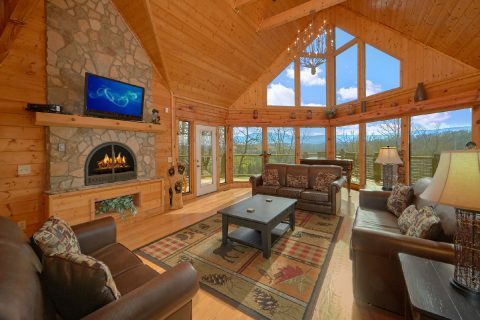 Take in awesome views of the Smoky Mountains from the living area's floor to ceiling windows. 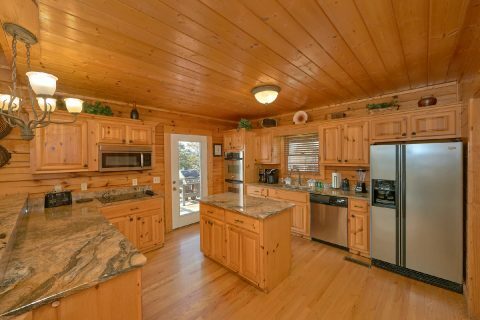 Prepare meals in your cabin's spacious kitchen with stainless steel appliances, granite countertops, and a breakfast bar. 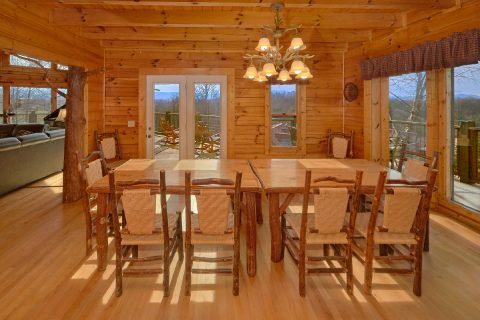 Your spacious cabin offers two extra-long custom dining tables – perfect for large groups. 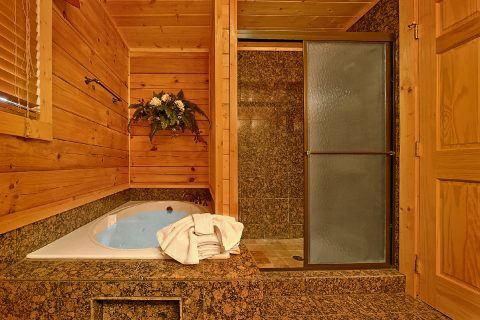 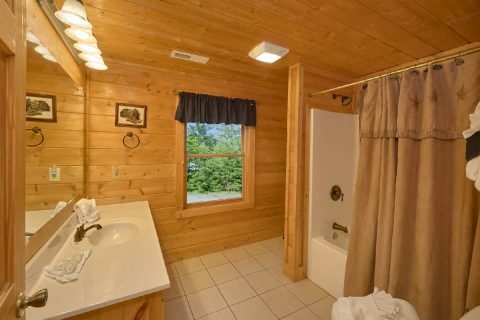 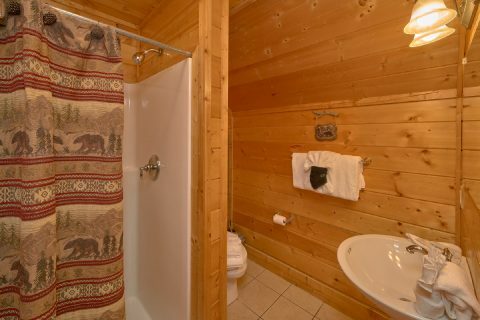 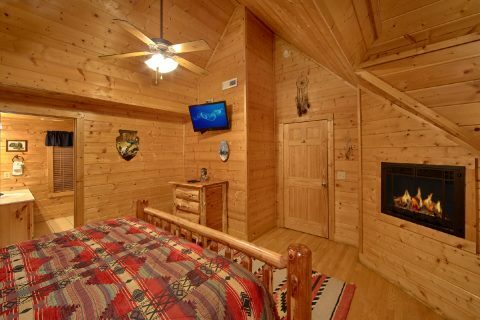 The first of your cabin's four king suites are located on this level and features a king-size bed, fireplace, television, and full bath with jacuzzi tub. 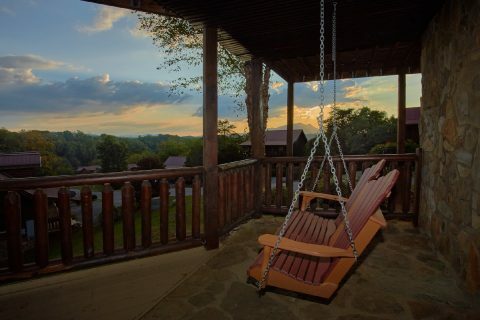 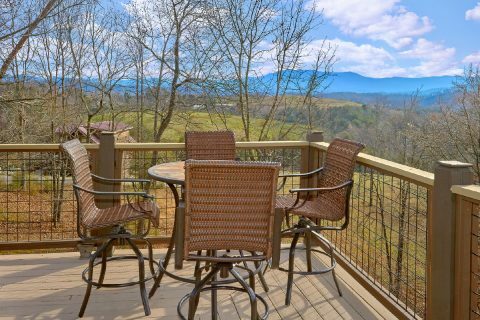 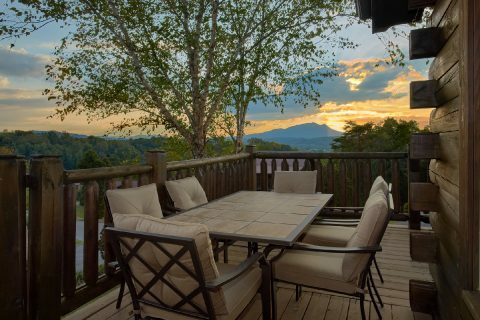 Outside on the wrap-around porch, enjoy more spectacular views of the Smokies from several seating areas or the porch swing. 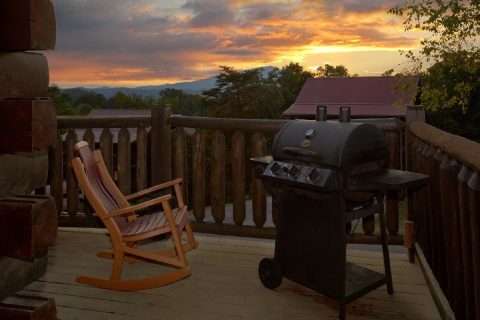 Host a cookout on your gas grill for a meal filled with the flavor of the outdoors. 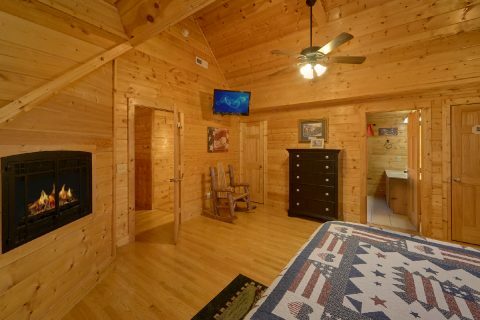 Upstairs, your home theater lodge boasts three more king bedrooms. 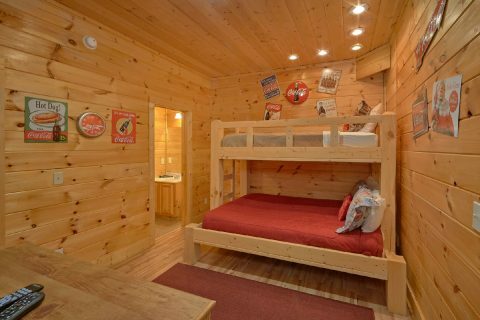 Two are king suites - each with an expansive king-size bed, fireplace, private full bath, futon sitting area, and a television. 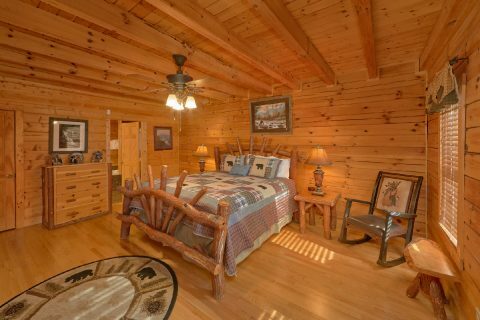 The third bedroom has a comfortable king-size bed, television as well as access to a full bath. 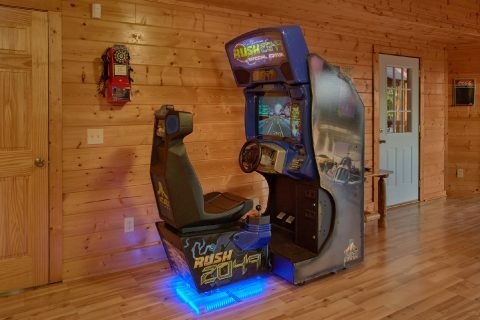 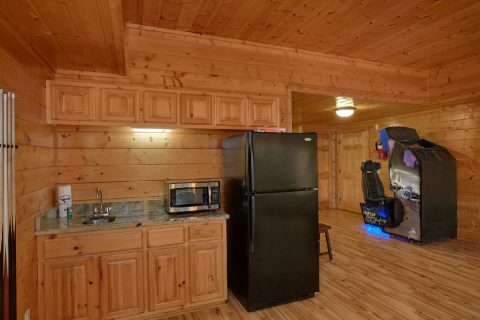 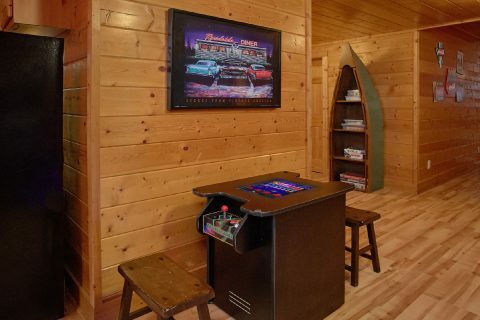 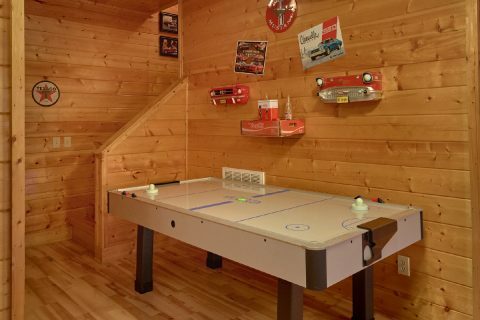 Stepping downstairs, this home theater lodge in Pigeon Forge features a game room that provides hours of entertainment for everyone and offers a sit-down race car game, a table top arcade game, air hockey table, pool table, and wet bar. 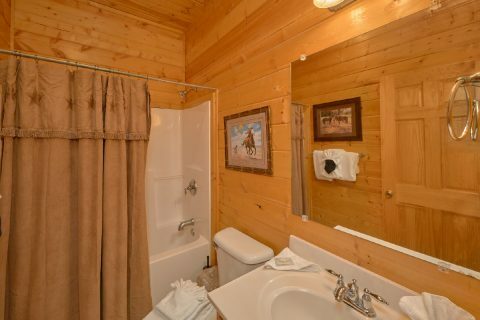 There are two bedrooms on this level which both offer full baths and televisions. 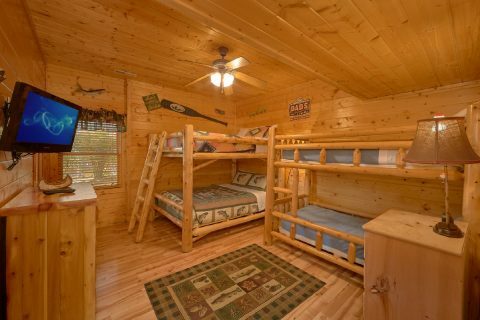 One of the bedrooms provides a comfortable queen-size bed, while the other boasts both queen and twin bunk beds. 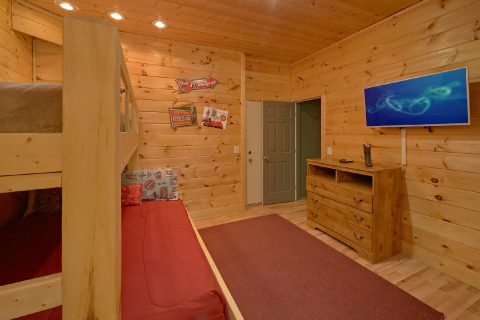 Additionally, another bedroom provides a twin over a queen bunk bed, a television, and an Xbox 360. 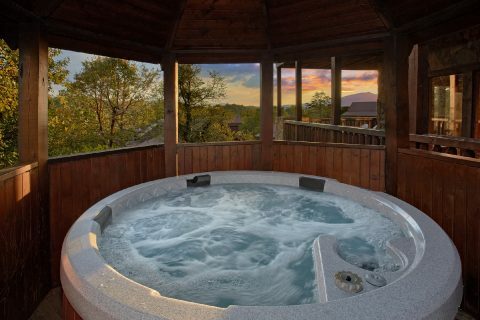 The porch on this level features a private, gazebo style area that houses your year-round hot tub. 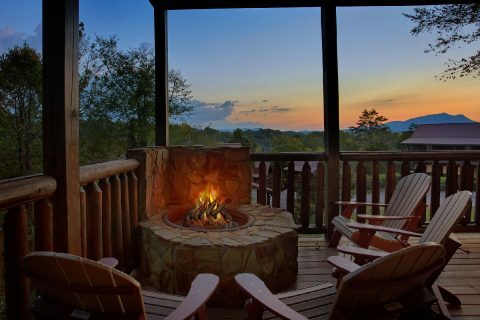 Better yet, this cabin's lower deck also comes with a gas fire pit that's perfect for enjoying a relaxing evening underneath the starry Smoky Mountains night's sky! 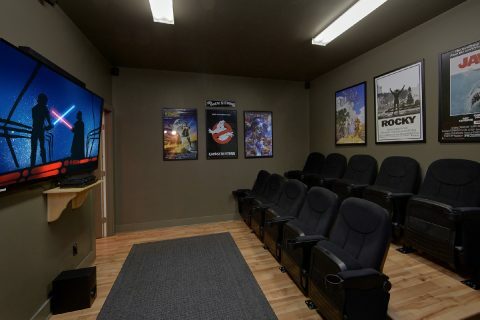 Your home theater lodge in Pigeon is the ultimate experience in Smoky Mountain cabin vacationing with its state-of-the-art home theater room with its large television, surround sound system, comfortable couches, and extensive DVD movie library! 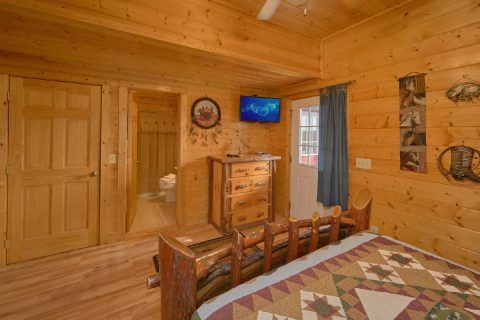 Book your home theater lodge in Pigeon Forge online to get your immediate Online Cabin Discount!